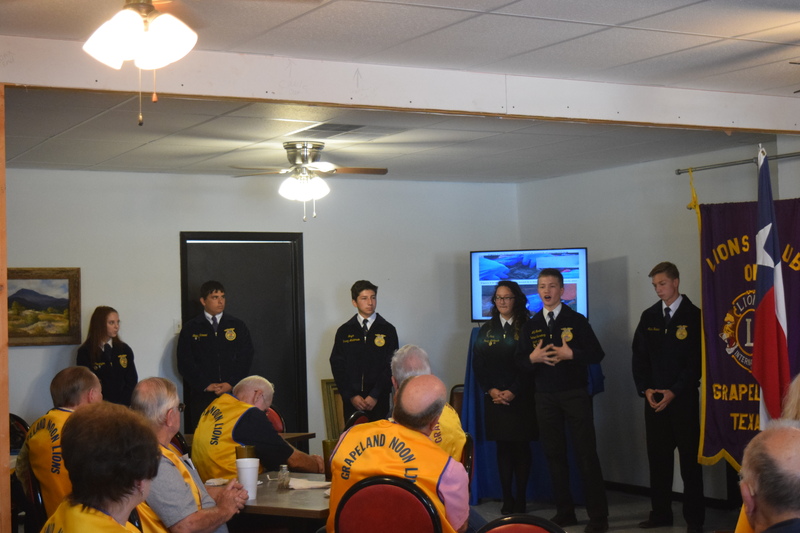 GRAPELAND – The Grapeland FFA Ag Issues Team was on hand during the Thursday, Oct. 19 meeting of the Grapeland Noon Lions Club to hone their skills as they ready for the district competition on Nov. 9. Grapeland FFA Advisor Shellee Goolsby opened the presentation and said this was the first time the team had practiced in front of an audience. The team – comprised of Mark Hanna, Blake Howard, J.D. Martin, Taylor Pennington, Bryan Perez and Stacy Perez – presented arguments both for and against the use of hog bait as a means of controlling the feral hog population in the state of Texas. Specifically at issue was the use of a hog bait known as Kaput, which contains an active ingredient known as warfarin. “Warfarin is an anticoagulant or blood-thinning agent that’s been used for decades to control rodents. In small doses, the agent is used in humans to help prevent blood clots. In larger doses it can cause internal bleeding and death in some mammals,” according to the Kaput website. The FFA students provided a timeline of the introduction and the subsequent recall of the Kaput product which turns the fatty tissues of a feral hog blue, approximately 24 hours after ingestion. The various costs and benefits were examined by the FFA students as both sides weighed in on the matter. Following the presentation, the Lions were provided a recap of the recently concluded 2017 Peanut Festival by Club President Mike Goolsby. Goolsby informed the club after all expenses were factored in, the club was looking at turning a profit of approximately $1,500. After providing a breakdown of the various costs, Goolsby said he would like members to consider looking at different food products which were less labor and cost intensive or to simply give up the food booth and concentrate on the parking. Jeanine Murphy-Goolsby was inducted into the club as a new member. The minutes and financial reports were approved as given.